The reading this Shabbat is from Leviticus chapter 14:1-15:37. It is a short parashah with essentially one topic, the laws of purity. Now, the issue of purity is not so popular in the Christian religions. It is hard for us to understand. We have showers and bathtubs at home, and we wash very often. We also don’t have the concept of spiritual cleanliness or purity. Let me try to explain these concepts in our 21st Century perspective. Let us look at this verse more carefully: Baptism is something that all Christians know at least something about. Catholics churches and high Protestant churches baptize their babies with sprinkling a little water on the head of the baby. The Greek Orthodox and Russian Orthodox, Coptic, and Ethiopian Churches also baptize babies, but by immersion, totally dipping the baby in water. These churches baptize the babies because they believe that without baptism, these babies will go to hell if they die. The problem with this traditional church interpretation is that the first phrase, “which corresponds to this”, is totally ignored. “Corresponds to” what? The context of these verses is Noah’s flood. Noah and his family were saved by the flood because the water lifted his boat, ship, above the water, and this is how Noah and his family were saved. There is no magic in the physics of water lifting and floating a boat. However, when a baby or an adult is baptized, the water makes the baby wet, but it has no magic to ensure that this baby will be saved in the Judgment Day and go to Heaven. The text in Peter’s letter also makes it clear that baptism is not a bath or a shower that cleans the body and thus saves by cleanliness. Baptism is “not as a removal of dirt from the body”, it is “as an appeal to God for a good conscience”. The formative word here is “AS”. In other words, it is an image, a picture, an example, that uses the resurrection of Yeshua our Messiah as an example of salvation by making us followers of the Messiah. As the Messiah went to Heaven after His resurrection, so we, who simulate His death and resurrection and ascension to Heaven when we are baptized, so we appeal to God as followers of the Messiah Yeshua and participators in His death, burial, and resurrection, when we are baptized, because we are subjected to Him, that is, to the Messiah. What can be clearer than the words of the Apostle Paul here? If you don’t believe and are dunked in water – you will be condemned. In other words, without faith, believing, the water will not save you. The vestige of the purity laws of the Torah (The Law of Moses) is now summed in the one act of faith that we all must take – and that is the participation symbolically in the death, burial, and resurrection of the Messiah, and the privilege of following Him into the presence of God in Heaven. Let us all refocus our lives with these reminders of our need for purity in both the heart and our lives. The Israeli election is over, and Benjamin Netanyahu was the winner. This is Netanyahu’s fifth term in office as the prime minister of Israel. He needs our prayer and the state of Israel needs your prayers. It is important for you to pray for Israel and pray for the Jewish disciples of Yeshua in Israel. There are forces rising in Israel that will make the lives and the future of the Jewish disciples of Yeshua in this country much more difficult. We need your prayers and your support. Please continue to pray for Netivyah and the Roeh Israel Congregation, and for our brothers and sisters in Brazil, the Teaching from Zion Ministry, and the Har Zion Congregation, and the ABRAJIN non-profit organization. Please also keep in prayer the congregations in Vitoria, Curitiba, and in so many other places in Brazil. We are all working very hard for the restoration of the Latin hidden Jews, or lost Jews, that are victims of the Spanish and Portuguese inquisitions. Please pray for the conference that will be held in the middle of the month of May in Castelo de Vide, Portugal. We need your prayer support and your material support to make this conference what God wants it to be. I especially appeal to brothers and sisters in Europe to join this conference because the Catholic Inquisition was, generally-speaking, a European problem. 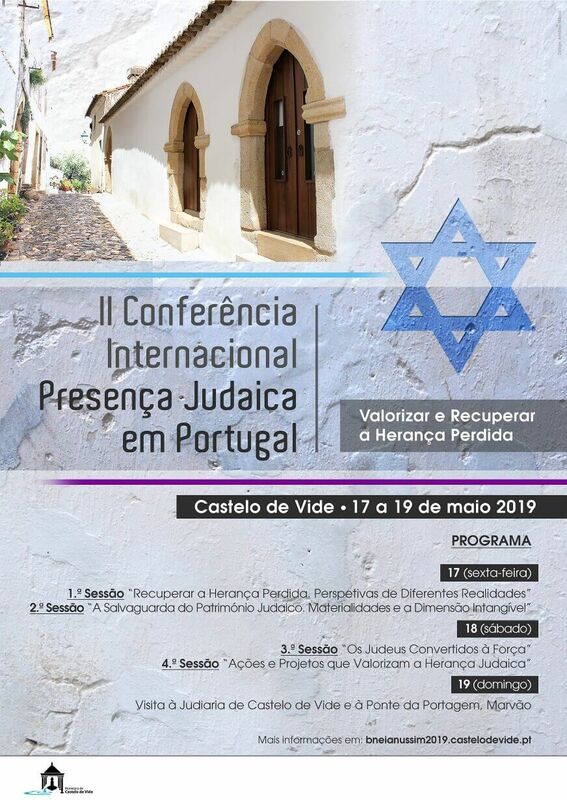 We need our brothers from Italy and from Spain and Germany and Finland and Holland to make a major effort to come to Castelo de Vide and be a part of this effort to restore the Marrano/Anussim Jews back to their identity and back to Israel. Please make a special effort to participate in this important event for the future of Israel and the restoration of the decendents of the victims of the Inquisition to Israel, and their return to the Land of Israel. You can also go to the web page of the Castelo de Vide municipality and see the program. It is not totally the final program, but you will get a picture of the important people who are going not participate in that conference. There are still places to join us on the Netivyah 40th Anniversary Tour. This will not be a normal tour that most of the tourists to Israel take. It will be a special tour with special events and places that the guests of Netivyah will experience. It is a celebration of God’s grace and goodness, allowing us to minister and serve Him for 40 years. We chose 40 years because of the story of the Exodus from Egypt and the 40 years of the wilderness. We see this as a step into the second period of our service to God, with new-generation leadership and a renewal of the vision and the mission that God has for Israel and for the disciples of Yeshua. We have a very dear family living in Sweden that are faithful prayer partners for Israel and for Netivyah. Pray for the Lucca family in Sweden. This precious family has been praying and standing with Israel for many years, and now several members of this family have some health challenges and need our prayers. Our dear sister Ruby Little in Oklahoma is suffering from the aftermath of the chemotherapy. Ruby has to decide now if she will continue with more chemotherapy or defer this option. Eli Levi is in Cincinnati with his two sons and is continuing with more chemotherapy to conquer the cancer in his body. Please keep Eli in your prayers. Please don’t forget to pray for my family and especially for Marcia my dear wife, and Danah and Noaam and all those on this prayer list – that God will be glorified in their lives and in their healing. Keep Barry our son and his family in your prayers. It is so very important for the Shulam family to be under the wings of God’s grace and stay firm in the faith and raise their children in the Lord. Our dear brother Efim passed from this world to be with the saints eternally. His widow has no access to any funds until all the paperwork is processed. This could take a few months. Efim our dear brother did not make the necessary steps to take care of these mundane and logistical needs. Our congregation and Netivyah will have care for the widow until the legal issues are resolved. Please pray for Elena Litvak, Efim’s widow. It is our God-given duty. Eddi Santoro is also in urgent need for prayer. Netivyah is receiving so many messages of gratitude and thanks from the over 200 soldiers who are serving in the Israeli Defense Forces. We appreciate so much the contributions for the purchase of the van for Netivyah. The generosity of so many brothers from around the world has been wonderful, but we are now only halfway of what is needed to replace the Netivyah van. Please continue to pray for Netivyah and the van that is needed so much for the work of feeding the poor of Jerusalem, serving the youth, the shopping every week for the HaMotzi food program, and for so many other very important services that are needed by both the congregation and Netivyah. Please remember our dear brother Jacob Damkani in your prayers. I visited Jacob Damkani this week. Jacob, and his wife Elisheva, and all the family, need your prayer. It will take a miracle from God to restore Jacob to a normal life. We do believe in miracles from God. Dr. M. Song, from Korea, and his whole family needs our prayers. Dr. M. Song is one of the real knights of God’s Kingdom in this century. He and his family need our prayers. There is no one in the world that I know that is such a prayer warrior for Israel and for the Jewish Disciples of Yeshua in this land like Dr. Song and his family. I am adding two very important prayer requests: Keep Um Abu-Eid in your prayers. Please continue to pray for our Jewish brother Hillel from Helsinki, and Keijo and Salme in Nokia, and for Tim Tucker, Anne-Mirjami, Satu-Maria and Anna-Majia, Sinni Tuuli, Erki and Sirpa, Keijo and Salme, Evelina, and Eva H.
Continue to pray for Julia and Victor. Keep in prayer Pastor Isaac in Chennai, India, who has a deep love for the Lord and for Israel. He is sick with kidney problems and needs a dialysis treatment several times per week. Margareta is a dear woman who is orthodox Jewish, please keep her in your prayers. I can report that Margareta has received grace from the Lord and her terrible situation has improved dramatically. In our congregation please lift in your prayers the following brothers and sisters who need the Lord’s gracious touch of healing: George, Gary, Melanie, and Aharon (Nancy and Don’s son), Sarit, David S., Gabriela, Ahuva, Leah, Ilana, Yehuda H., Hannah, Gabriela the young, Zvi D. and his dear wife, and especially Nancy. Nancy is recovering from a CVA (stroke). The Lord was merciful, and Nancy will fully recover from this stroke with God’s help. These are brothers and sisters from around the world who need your prayer and your intercession and healing: Paulo, and Noami. Marcelo’s parents, Curita Sensei, the Abe family, Toru, Takeo Sensei, Daisuke Sensei, Tomoko San, Yumi, and her father and family. Please pray for sister Oksanen. They need prayer for illness. Please pray for Louisa and Tony in Hong Kong. These are all people for whom you are praying, but I want you to know that these are also people who pray for Israel and for Netivyah and stand and support both Israel and Netivyah. There is a messianic congregation in Kenya. The leader of this congregation is Asher Gabriel. This congregation and their leader Asher Gabriel need our prayers. They need prayer for just about everything. Although we don’t know them personally, we do know one very dear sister from that congregation spent several months with us in Jerusalem. I wish all of you, who stand with Israel and who pray for Jerusalem, the best of the Lord’s blessings and the fulfillment of all His promises to His faithful children. For the Lord is gracious and longsuffering and good to all, but especially to those who have faith and hear His word and do it. Those who hear God and do His will are the ones who are called wise! Those who only hear His word and don’t do it are called foolish! Let us all strive to be wise and never foolish! The best is yet to come! Israel will be saved!